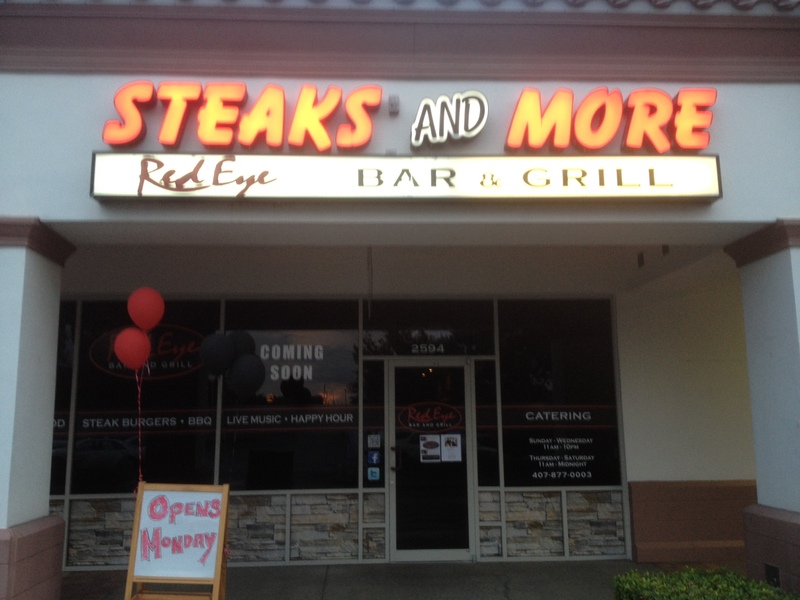 Recently I was invited to attend the pre grand opening of Red Eye Bar & Grill. It’s a brand new restaurant that just opened up in Ocoee, FL. You may recall the “Red Eye” name. The owners of Red Eye Bar & Grill used to own the Red Eye BBQ truck, it was pretty well known in the food truck community. They actually sold the truck and the owner Rob Nelson moved away to Hawaii for a year to work in a corporate setting. Well after his stint in Hawaii they moved back to Central Florida and Rob bought the location that was previously Matthew’s Steak House, it was a German Steak House. The Red Eye Grill just does not serve up BBQ they also offer steaks and seafood. They have really expanded their menu from their food truck days. They also offer craft beers and have a nice wine menu. Red Eye also has nice new HD TVs around the restaurant so you won’t miss your favorite game! I started off with the Red Eye Sliders. 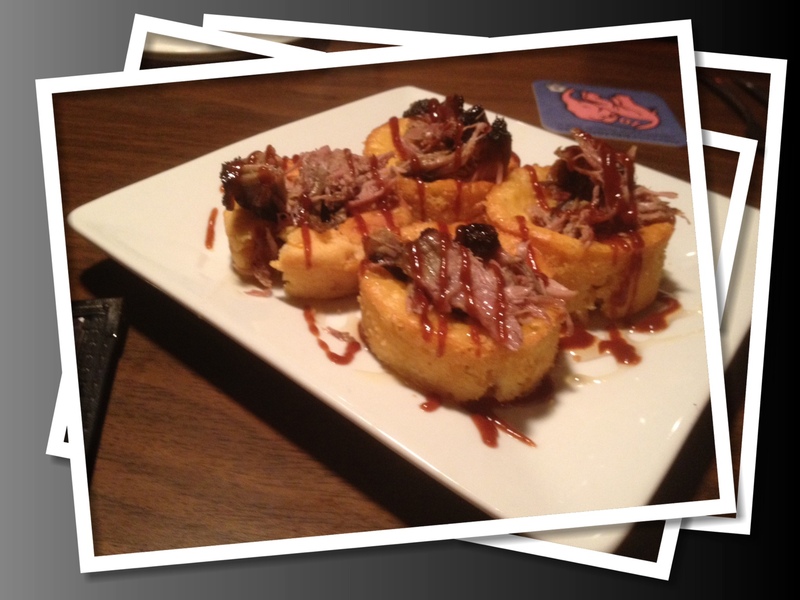 This family secret recipe starts with base scratch homemade corn muffins stuffed with slow roasted pulled pork and topped with the house BBQ sauce. Wow! These were really good! 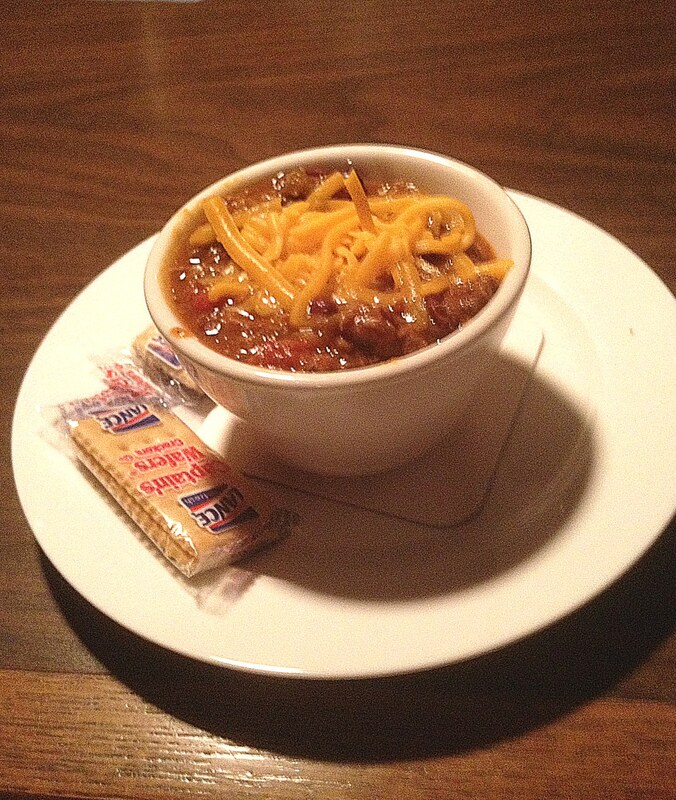 Next, I had the Jim Beam Brisket Chili. Another home run! The meat in the chili which was the brisket which was extraordinary flavorful. The flavor of the kidney beans, meat, tomato sauce, with fresh grated American cheese on top was probably the best chili I have tried in this town. I also tried the half rack of the St Louis Style ribs with a side of Mac n Cheese. The ribs were very tender as expected. I really liked the fact that you can use a knife to cut the ribs. 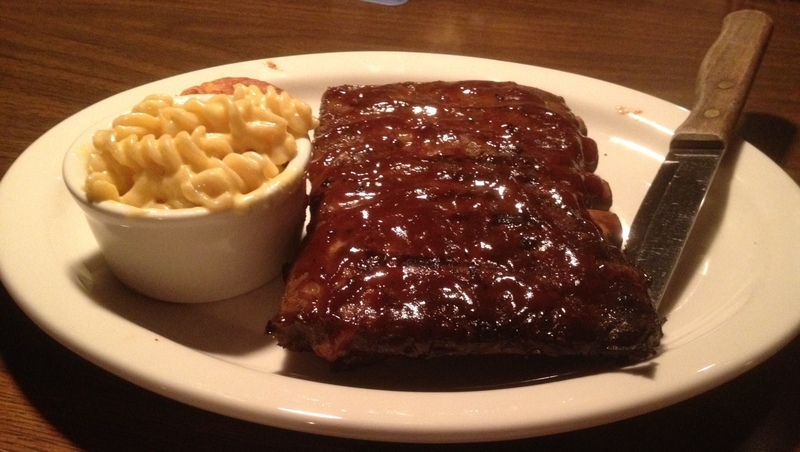 Most folks refer to great ribs for the need of the ribs to be falling off the bone. However, master award winning bbq pit masters some how make their ribs like Red Eye, where the meat or the rib is sturdy, but when you bite into the rib or the meat itself it is so tender it still falls off the bone at that point. Long story short, I can tell Red Eye did their home work when it comes to making BBQ St Louis Ribs. I also tried the Mac n Cheese. The mac n cheese was flavored by 5 sets of cheeses. Sometimes this can cause saltiness but not this mac n cheese. Very good mac n cheese! Who said you can’t eat half way healthy at a BBQ restaurant? So we tried the Grilled Skewer Shrimp entree. 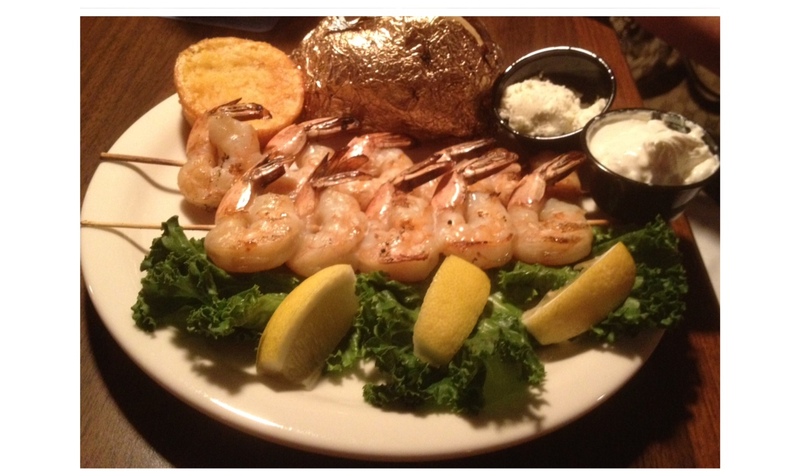 The grilled shrimp were grilled perfectly and were not over cooked, which is easy to do on a grill. The shrimp had a nice smoky seasoned flavor to it. I dipped the shrimp into some of the different bbq sauces and was in heaven. The shrimp were served with a nice sized baked potato with butter and sour creme on the side and if that was not enough it also came with a sweet corn muffin. I don’t have a picture of this but I also tried the steak burger. The steak burger had 3 different types of meats blended together. The burger was seasoned perfectly with a special seasoned spice. The owner Rob Nelson said he could not give me his special spice mixture (never hurts to ask). The burger was so good you could just eat it plain, and I did. 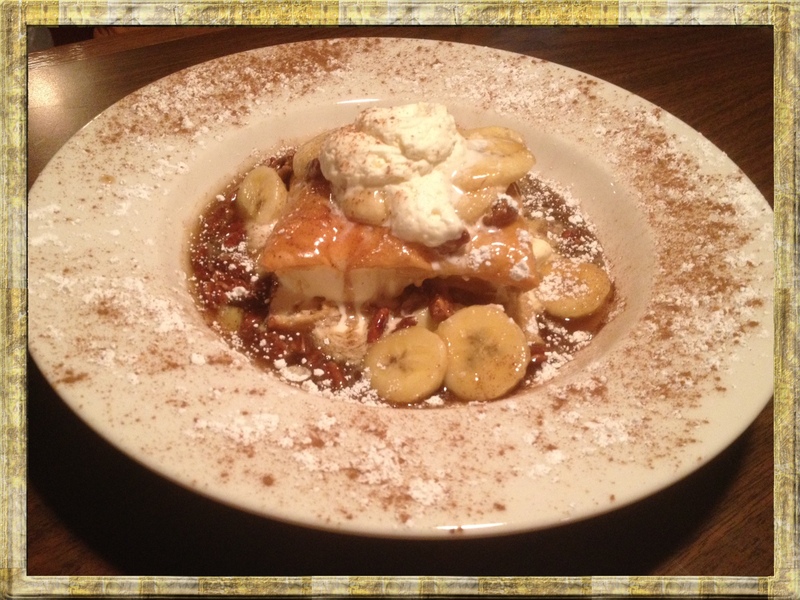 For desert, I went over to some of the other food bloggers table and tried the Bananas Foster. I would like to offer a special Shout Out to Droolius from www.droolius.com and Katie from www.katiecucina.com for allowing me to try their Bananas Foster. The menu says it serves 2 but it I believe it would feed 3-4 just fine. This desert was served with fresh bananas, cinnamon, powder sugar, hint of dark rum, with vanilla ice cream and the puff pastry. All 3 of us food bloggers really enjoyed this satisfying desert. It was a great way to end our dining experience. A Big Thank You to Red Eye for having us out!